During the 2007 field trip to Khinalug, we took video records of our work. 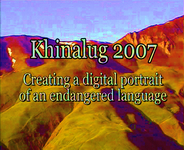 We are now pleased to offer you a 20 min movie telling about documenting an endangered language. The film presents the major types of our activities: transcribing the texts, recording phonetic samples, checking and recording the dictionary, reconstitution of a dialogue previously recorded on paper only. The film is available in Russian with Engllish subtitles. Find here also the restored 1971 Kamchatka field trip movie (ca. 400 Mb).